Foodstock LDN is the food festival that has something for everyone. Street food, farmers’ market, local craft beer, live music, entertainment for the kiddies, workshops for the adults, and a large outdoor screen to watch the Wimbledon finals! Bring your friends for an afternoon of entertainment in Battersea Park. Whether you’re sweet toothed or have more of a savoury palate, we’ve got something tasty for you. Our global-inspired flavours include Korean BBQ, Indian, Caribbean, contemporary Moroccan, Nigerian, Greek, Brazilian, Venezuelan, Chinese, Spanish, French, Italian, South African – even sushi burritos! And our menus cater to vegetarian, gluten free, vegan, meat-lovers; no matter who you are or where you hail from, you just need to love food and music. Local Craft Beer features heavily at our bars in 2017. New-comers Mondo Brewing Company and return favourites Sambrook’s Brewery are both based a stone’s throw away from Battersea Park. With multiple bars at the festival you will be spoilt for choice, from cocktails to cider slush, Foodstock LDN has the best in the business. Entertainment is an equally important part of the dining experience and this year’s Live Music at the bandstand is curated by Tony Moore, a man with a long and eclectic career in the music industry. For the last 20 years he has been championing new and emerging artists. 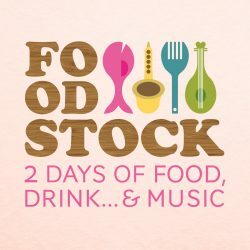 He has created two days of music, highlighting the next exciting generation of creative artists, passionate performers and future superstars for Foodstock LDN. For the second year running, our Children’s Area will be taken over by one of our sponsors Sharky & George. They will be keeping the little ones squealing with delight with free organised games and workshops in the shade. There will also be some small funfair rides including zorb balls on water. Plenty to keep children entertained all afternoon. Tennis fanatics, who are also food and music lovers, will not be missing out on the action as this year we have our very own Wimbledon Corner, sponsored by Smart Hospitality. You can plonk yourself in a deck chair in front of the huge screen and watch the action, whilst tucking into the season’s best strawberries and cream, with a jug of your favourite summer punch. Online Advance Entry Only tickets are £2 for adults and £1 for children and are available at www.foodstock.london/tickets. Tickets can be purchased on the day either online, or onsite at £5 for adults and £2.50 for children. Booking fees apply. Can’t believe you can get all of this for so little? Come along and see for yourself. Throughout the weekend there will be a range of fabulous workshops for you to join in with. All workshops and are on a first come first served basis. pick up a free programme on site so you don’t miss out! Battersea Park has many entrances, the closest one is Chelsea bridge gate, follow the road to the mini roundabout and we are located on the left – you can’t miss us! Use “Foodstock LDN” in Google maps (SW8 4NW) – this will bring you straight to the action.